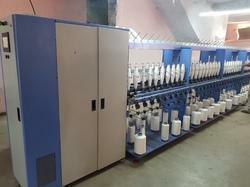 Prominent & Leading Manufacturer from Surat, we offer servo controlled cop winder. Rewinder for Fileament Yarm from big pacakges to small cops or boboins for twisting/covering machine. Servomotor driven with PLC system featuring the constant yarn speed without the tension variation to ensure superiour quality of Winding. All the extra parameters can be set by touch screen HMI system for which it makes more convenient operation even for unskilled operator. The flexibility of its function allows the winding of all Pirn, Bottle and Spool Bobbins. Cop length up to 420 mm. Dia up to 380 mm and 420 mm Length Dt Cops. Length up to 300 mm With 280 mm Traverse. Warp, Random, Compound, Bottle, Bobbin, Combination Along With Coil Bind Technology.